Antipoverty news items from around the country. This is what a real food policy conversation looks like: In contrast to the rubbish that passes for a conversation about food and hunger in Congress, last week’s Forum on the Future of Food in New York City offered substantive talk from six mayoral candidates about how to create a healthier, fairer, more sustainable and economically stronger food system. Bill de Blasio, Christine Quinn, John Liu, Sal Albanese, Anthony Weiner and John Catsimatidis all participated; William Thompson was a late cancellation due to an unspecified emergency. The forum was moderated by Marion Nestle, an award-winning author and the Paulette Goddard Professor in the Department of Nutrition, Food Studies, and Public Health at New York University. Over 730 people packed the auditorium and two overflow rooms, 1,300 people watched the live webcast and #nycfoodforum trended nationally. The candidates discussed a range of issues and ideas, including: utilizing 5,000 acres of unused land within the city limits for urban farming; ensuring living wages for food workers—14 percent are currently on food stamps, and 90 percent earn below a living wage; boosting school meals—including universal breakfast in the classroom, and grab-and-go carts—to reduce child hunger; revamping city procurement to promote local and regional agriculture; incentivizing green markets to operate in more low-income neighborhoods and establishing transparent benchmarks on SNAP participation, free school meals, urban farming etc. to measure concrete progress in the effort to improve the food system. ACLU v. Morgan Stanley, on behalf of black homeowners in Detroit: A judge ruled that the American Civil Liberties Union (ACLU) can move forward with its case alleging that Morgan Stanley discriminated against black homeowners in Detroit, financing high-risk, predatory loans in economically vulnerable neighborhoods. The lawsuit is the first to connect racial discrimination to the securitization of mortgage-backed securities. The ACLU is also calling on the Department of Justice to investigate whether other Fair Housing Act claims are available to hold other Wall Street banks accountable. “Geography matters much less for the children of well-off parents—who tend to do well across the board—but for those at the bottom of the ladder, growing up in poor neighborhoods in Atlanta or Chicago often means that the chances of achieving higher incomes later in life are significantly lessened.” Read more here. ACCESS to Financial Security for All: Launched by PolicyLink, a national research and action institute advancing economic and social equity, ACCESS to Financial Security for All is designed to help advocates, policymakers and organizations share information, learn about promising policies, connect with allies and advance progressive policies to close the racial wealth gap and promote financial security for all. The site provides information on the latest research, recent media coverage and blog posts, and events from the asset-building field—all with the goal of promoting solutions to the racial wealth gap. Dual tracking in Minnesota: “Dual tracking” occurs when a homeowner is foreclosed on while still negotiating with a bank for a mortgage modification. This practice and other mortgage servicing abuses were supposed to be brought under control by the National Mortgage Settlement, but—shocker—the Settlement Monitor gave the big banks failing grades for compliance with basic standards. In Minneapolis, Jonathan Ceballos reports that he and his family went to their local JPMorgan Chase Home Mortgage Center on Tuesday with revised loan modification documents that the bank had requested. But the next day, thirty sheriffs’ deputies attempted to evict the family from their home—breaking down the door, arresting two people and boarding up the house. But seventy-five community members—organized by Occupy Homes MN, and including members of Ceballos’ union, SEIU Healthcare Minnesota—gathered and protested during the eviction. As soon as the deputies left—to chants of “don’t come back”—the Ceballos’s supporters pulled the boards off and reclaimed the house. When the Minnesota Homeowner Bill of Rights goes into effect in October, borrowers who are victims of dual tracking will have legal recourse. But until then, you can support the Ceballos’s effort to remain in their home of twelve years here. Coalition of Immokalee Workers: has redesigned its website. The Take Action page is especially convenient—an easy way to get involved with the most amazingly effective, creative and courageous organization I’ve ever covered. Over the past twenty years the CIW has worked from within its own community of Immokalee to end longstanding human rights abuses and twenty years of declining wages in the tomato industry; organized (and won) the first-of-its-kind Taco Bell Boycott; signed agreements with fast food giants McDonald’s, Burger King, Subway and Chipotle, supermarkets Trader Joe’s and Whole Foods and four of the country’s leading food service providers; and reached a groundbreaking agreement with the Florida Tomato Grower’s Exchange that paved the way for the implementation of the Fair Food Program in over 90 percent of the Florida tomato industry. If you don’t know the CIW, you are missing out. Check ‘em out and sign up for their newsletter today. Federal Investments in Children Down Three Years in a Row: First Focus, a child advocacy group dedicated to making children and families the priority in federal policy, released “Children’s Budget 2013,” a detailed analysis of the more than 180 federal investments in children. The analysis finds that total spending on children has declined for three consecutive years. Since its peak in 2010, total spending on children has dropped by nearly $55 billion, or 16 percent after adjusting for inflation. The share of the federal budget invested in children is also down 8 percent from 2010, and children have suffered a disproportionate share of cuts under austerity policies like sequestration. “America can’t afford to overlook children as we make the budget and policy decisions that will shape their lives,” said former Republican Congressman Michael Castle. Expanding EITC for childless workers: The Earned Income Tax Credit (EITC) is one of the most successful antipoverty programs in the United States. It supplements the earnings of low-income families by as much as $6,000 a year, and lifted 6.6 million people out of poverty in 2011. But childless workers barely benefit from the EITC, if they benefit at all. For example, a childless adult working a full-time, minimum-wage job wouldn’t qualify for the EITC because his or her earnings would exceed the income limit established for workers without children. “As a result, childless workers are the sole group that the federal tax system taxes deeper into poverty,” writes the Center on Budget and Policy Priorities. So it’s important that New York City is launching an $11-million, four-year pilot program that will offer up to $2,000 a year over a three-year period to participants with earnings up to $26,800 per year. The pilot will include 6,000 participants—3,000 eligible to receive the expanded EITC and 3,000 forming a control group. It will be implemented and evaluated by MDRC, an education and social policy research organization that examines policies and programs affecting low-income people. Massachusetts campaign for paid sick days and raised minimum wage: Nearly 1 million workers in Massachusetts—almost one-third of the state’s employees—are at risk of losing their wages and/or jobs if they have to stay home to care for themselves or a sick relative. On Wednesday, Raise Up Massachusetts, a statewide coalition working for earned sick time and an increase in the minimum wage, officially launched efforts to bring these two issues to the November 2014 ballot. The ballot initiatives would raise the minimum wage from $8 to $11 an hour, and offer minimum wage workers forty hours of earned sick leave. It would be the first time that paid sick days would appear on the ballot as a statewide initiative. Thank you: RESULTS, for honoring me this past weekend with the Cameron Duncan Media Award. It’s especially appreciated given your great history and track record of effectiveness—including, most recently, a terrific twenty-eight op-eds or letters to the editor regarding SNAP placed in local media by your volunteers—in just over a month! Children in poverty: 16.4 million, 23 percent of all children, including 39 percent of African-American children, 37 percent of American Indian children, 34 percent of Hispanic children, and 14 percent of both Asian and Pacific Islander and non-Hispanic white children. Deep poverty (below half the poverty line, less than $11,510 for a family of four): 20.4 million people, one in fifteen Americans, including more than 15 million women and children. Up from 12.6 million in 2000, an increase of 59 percent. 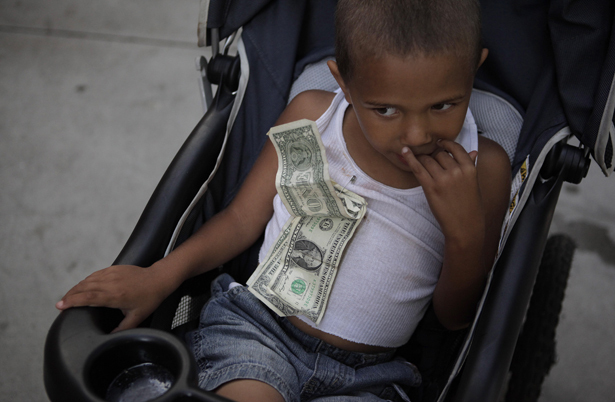 Children below twice the poverty level: 45 percent, 32.7 million children. People in the United States experiencing poverty by age 65: Roughly half. Jobs in the United States paying less than $34,000 a year: 50 percent. Jobs in the United States paying below the poverty line for a family of four, less than $23,000 annually: 25 percent. —Angela Glover Blackwell, at the Economic Policy Institute’s Unfinished March Symposium. Samantha Lachman co-wrote the “Clips and other resources” section. She and Aviva Stahl also wrote the “Studies/Briefs” summaries. House Republicans are trying to destroy the US Postal Service. Can the American Postal Workers Union successfully reform it before that happens?